Come learn about indigo + natural dye in a casual, fun and social setting! Dye Club DC is an event for those curious about dyeing with plants and who love learning with others. There will be several stations set up featuring different dyes and techniques, and you can choose to learn one, two, or all three of them. You are encouraged to bring items to dye from your closet or items you purchase. Dyeing is a great way to upcycle or refresh items. T-shirts, pillowcases, table/bed linens, fabric, scarves, tote bags, yarn, plant hangers, or anything else you can think of - as long as it has less than 50% synthetic content. These items will work best with indigo dye, but can be adapted for natural dye and eco-printing as well. 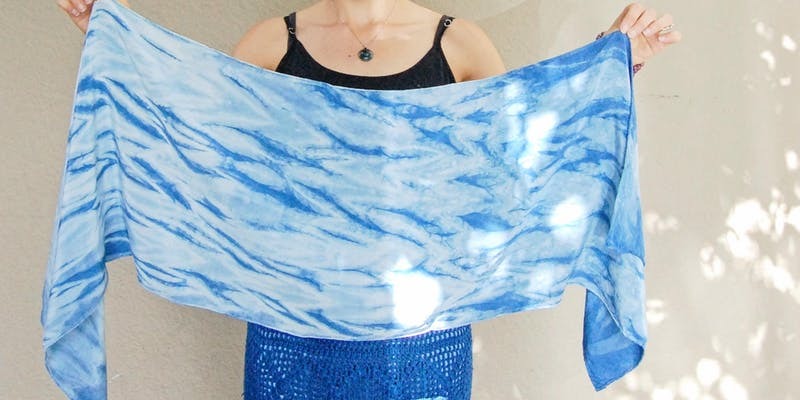 Indigo + Shibori - This beautiful blue dye pairs well with a Japanese tie-dye technique used to create geometric or abstract repeating patterns. It's a great way to upcycle items from your closet, so bring a few small to medium sized items that are light in color and have less than 50% synthetic content. Natural Dye - Each meeting, there will be a different plant (sometimes foraged in DC!) that is turned into dye. You'll learn how to extract the color from plants and how to dye your fabric for long-lasting color. There will be a demonstration on how to modify the dye to a get a different color from the same plant. Eco-printing - A technique where actual leaves and flowers are pressed onto the fabric to create beautiful, all-natural textile prints! Each meeting, there will be a different plant to print with and a demonstration on how to do so. $50 - all three techniques! Each participant will receive materials for each dyeing technique, and a limited number of additional items will be available for purchase. You are encouraged to bring your own materials to dye, from your closet or that you have purchased. Please choose 1, 2, or 3 from the ticket menu to select how many dyeing techniques you'd like to learn. Hope to dye with you!